Give me question paper for Kuvempu university, m.a. In education, 1st year, education in emerging India examination ? Here I am giving you question paper for Kuvempu university, m.a. 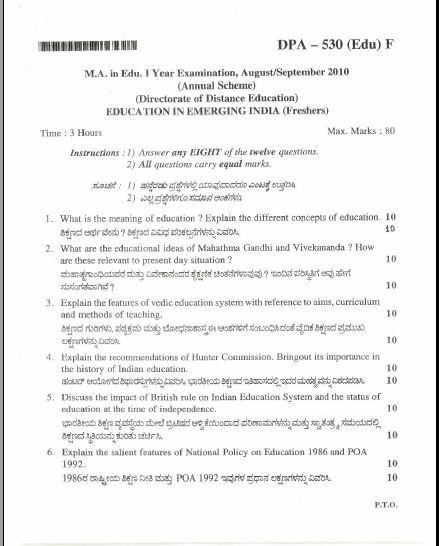 In education, 1st year, education in emerging India examination in PDF file attached with it so you can get it easily.. The paper is totally descriptive. The paper consists of total of 12 questions and the candidates have to answer any 8 of them. There are no sections in the paper. All the questions are essay types and there are no short answer type questions in the paper. The duration of the paper is three hours. The paper is marked out of 80. There are 12 questions in the paper, each carrying 10 marks. The candidates need to answer any 8 questions. Thus, the total mark is 80.